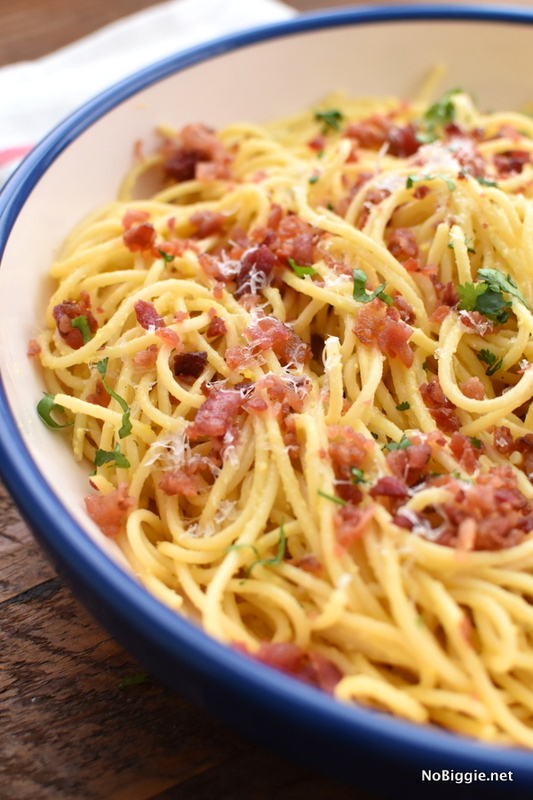 The easiest and MOST delicious dinner there is: Spaghetti Carbonara. It’s made with simple ingredients and so good! 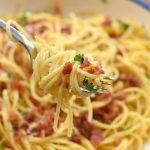 Spaghetti Carbonara or Pasta Carbonara is one of those go to meals that you can usually count on having all the ingredients and the ingredients are all so simple, but together they make magic! If you are feeling like it needs a little vegetable, toss in some frozen peas for a little more green. -Can I use any kind of pasta in carbonara? YES! You can use any kind of pasta, although we prefer spaghetti, capellini (angel hair) or linguini. -Can I use Kraft parmesan cheese in carbonara? No….don’t do it. Kraft parmesan cheese (the kind in the green cylinder container) will not melt into the sauce like freshly grated (real) parmesan cheese. 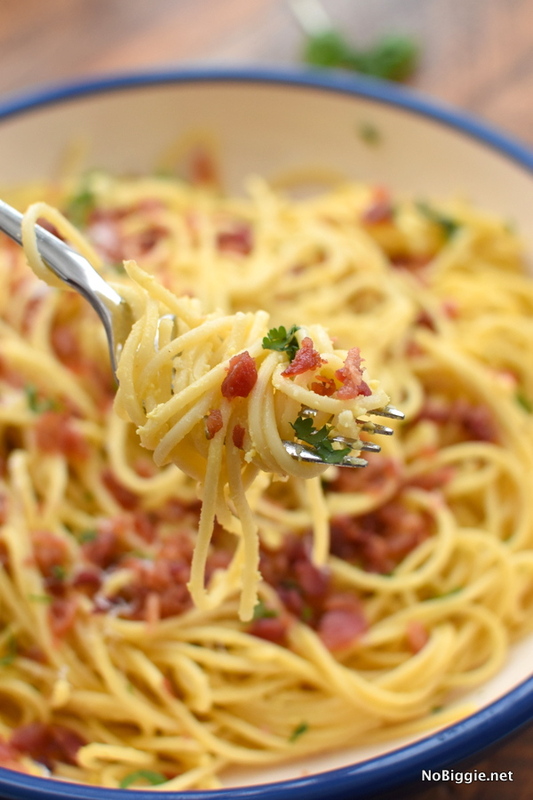 -Can I use precooked bacon in making pasta carbonara? Sure! It’s a total time saver. You can still render a little bacon fat from the precooked bacon in the pan enough to grease the pan to toss the spaghetti in and cook the garlic. -Do the raw eggs get cooked in pasta carbonara? Yes! The raw eggs get cooked from the residual heat of the cooked spaghetti, the hot pasta water and the heat of the pan. 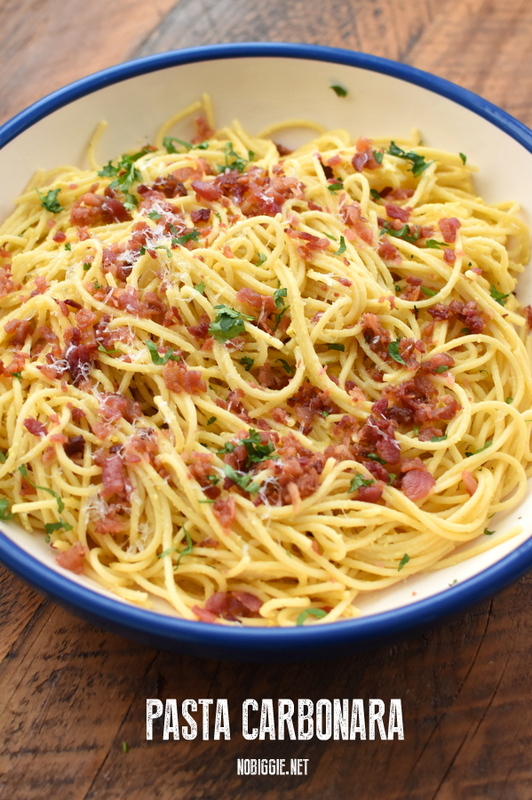 Our favorite easy dinner spaghetti carbonara loaded with crispy bacon, spaghetti coated in a creamy cheesy simple sauce. In a low wide pot with a lid bring 8 cups of water to a boil. Once boiling add 1 tablespoon salt to the water. Cook the spaghetti until al dente (slightly under cooked). Remove the cooked spaghetti, but keep the pasta water in the pot, you will need 1 cup of the pasta water later in the recipe. In a large sauce pan, cook the bacon over medium high heat until the bacon is browned and crisp about 10 minutes. Remove the bacon from the pan place onto a plate lined with paper towels to absorb excess grease. When the bacon is cooled to the touch crumble the bacon. Carefully remove most the bacon fat from the pan into a heat proof container. In a mixing bowl whisk together the egg yolk, eggs and freshly grated parmesan cheese. In the pan where you cooked the bacon set to medium high heat add the garlic to the greased pan and cook until fragrant. Add the al dente cooked (and drained) spaghetti. 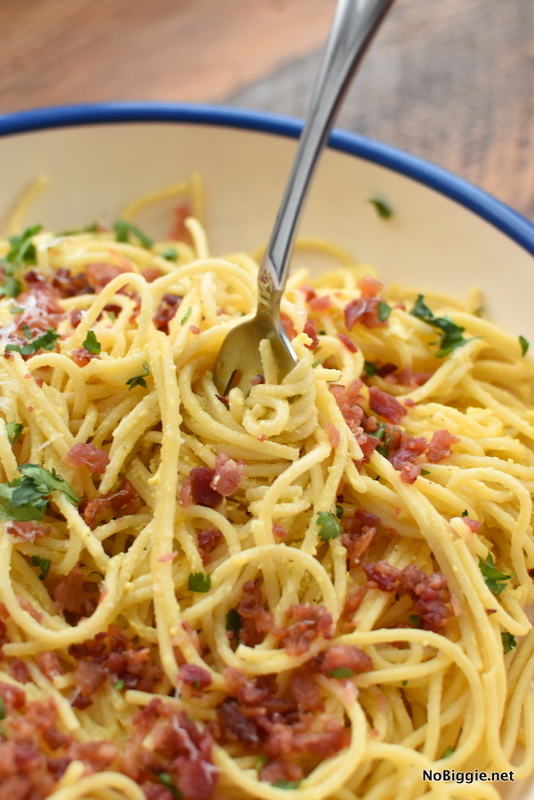 Toss the spaghetti around in the bacon fat with the garlic. Add 1 tablespoon more of the bacon fat if desired. Pour in the egg cheese mixture along with 1 cup of the reserved pasta water. Toss it altogether and the uncooked eggs will cook from the heat of the pan and the pasta. Toss in the cooked crumbled bacon, more grated parmesan cheese, and fresh ground pepper. Garnish with chopped flat leaf Italian Parsley. Serve warm. Do not use the Kraft parmesan cheese in the green container in this recipe, it does not melt into the sauce the same as freshly grated parmesan cheese.